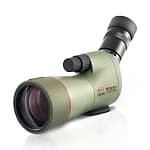 The Kowa Prominar TSN-550 spotting scopes are the first smaller than the TSN-880 scopes to feature pure fluorite crystal objective lenses. 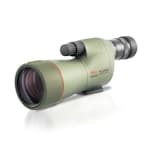 The TSN-550 scopes are waterproof and nitrogen purged, have a permanent 15-45x zoom eyepiece. Close focus is 9.8'.